A few weeks ago I was contacted by the lovely Jessica Olive for my first ever collaboration opportunity. Jessica is the heart and soul behind Twig and Bloom Goods. Twig and Bloom is a North Carolina based Etsy shop that specializes in high quality (and I mean high quality) tie dye items and accessories. At first I was just pumped that someone saw my blog and my style and wanted to work with me. Even more exciting, she wanted me to wear her pieces and represent her brand. But of course knowing me, that excitement was also slightly veiled by apprehension and anxiety. I thought to myself that I'm not worthy to wear this creator's work and embody all it represents to her. But then something awesome happened and my anxiety was quieted. You might be asking, what happened? Well, in all honesty Jessica is just an infectiously awesome person. Jessica emailed me regarding the collaboration and I couldn't help but be struck by just how important this brand is to her. Right off the bat I felt like I could relate to Jessica. She's a NC native, but isn't like most people around here. She told me she's always been the black sheep in her life and her passion to create unique pieces is actually driven by this feeling. In her own words, she wants all of the other black sheep out there to feel beautiful and unique in what they're wearing. Which if you've been following my blog for some time now, you know that's exactly the kind of mentality I aim to promote. I personally believe Jessica does a wonderful job of creating one-of-a-kind pieces for all of the one-of-a-kind individuals out there. That's what is so beautiful about her tie dying techniques. While items may be similar in color or style no two are identical, which Jessica mentions is just like all of us. I like to think this positive mentality adds a bit of poetry to everyday life and style. 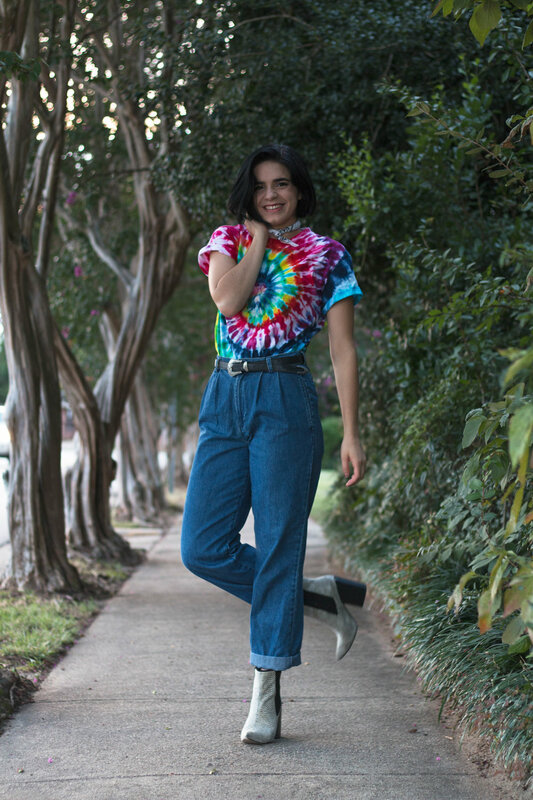 When it came time to take photos in my one-of-a-kind rainbow shirt I seriously couldn't help but smile. As I've mentioned on here before, I definitely think that what I'm wearing has an impact on my mood and this was no exception. Not only does my mood change based on how I feel in my clothes, but the more photo shoots I do the more evident it is to me that I naturally change my poses based on the outfit I'm wearing. This outfit, this top, made me feel so full of glee. I mean how often do you see me posing this fun and this smiley? There's just something about embracing your individuality and personal style that brings a smile to my face. If you want to add a little Twig and Bloom sunshine to your life you can shop the shirt I'm wearing right here. But I recommend you don't stop there. I definitely have to encourage you to take a look through all the good that Twig and Bloom Goods has to offer. You will not be disappointed. I would like to thank my best friend, Keldon for these photos today. When Jessica asked me for quality photos in this shirt, I knew just who to see! This guy is a dear friend and phenomenal photographer and I can't urge you to look him up enough. Plus he just started vlogging so I recommend you give that a look as well! Wearing this tie dye shirt and being associated with Twig and Bloom Goods is an honor. Thank you so much for this opportunity, Jessica. I can't wait to see the unique items you continue to create for all the black sheep out there.